While CT is sometimes performed as a complementary imaging technique to evaluate osseous integrity in patients with CES, the diagnostic accuracy of CT in detecting significant spinal stenosis and cauda equina impingement (CEI) compared with MR imaging is not well-defined in the literature. The purpose of this study was to evaluate whether CT could reliably identify significant spinal stenosis and rule out cauda equina impingement in patients presenting with clinically suspected cauda equina syndrome. This study was Health Insurance Portability and Accountability Act–compliant and was approved by our institutional review board. During a 12-month period, we reviewed the clinical and imaging data of 4691 consecutive lumbar spine MR imaging examinations performed at our institution. One hundred fifty-one patients met the following inclusion criteria: 1) acute neurologic symptoms (new onset or worsening of symptoms within the past 48 hours) with clinical suspicion of cauda equina syndrome (symptoms include severe low back pain, bilateral sciatica, lower extremity weakness, bladder/bowel dysfunction, saddle numbness, or reduced rectal tone); 2) CT of the lumbar spine performed within 48 hours of MR imaging; and 3) no interval operation or change in symptoms between CT or MR imaging. All imaging was performed in accordance with standard institutional spine imaging protocols. Noncontrast lumbar spine CT was acquired in the helical mode (5-mm thickness, 100 kV, auto-mAs) and reformatted at 2-mm intervals. Lumbar spine CTs obtained in conjunction with CT abdomen/pelvic examinations were reconstructed from the CT abdomen/pelvis source data and had the same scanning parameters following administration of 80–90 mL of nonionic contrast (iopamidol, Isovue Multipack-370; Bracco, Princeton, New Jersey). All axial CT acquisitions were reconstructed in the sagittal and coronal planes, in both soft-tissue and bone algorithms. MR imaging was performed on multiple different 1.5T and 3T scanners across our institution. Sagittal T2WI parameters were the following: TR/TE = 3600/100 ms, matrix = 290 × 230, NEX = 2, section thickness = 3 mm, gap = 0 mm. Axial T2WI parameters were the following: TR/TE = 5500/100 ms, matrix = 290 × 230, NEX = 1.5, section thickness = 3 mm, gap = 0 mm. We analyzed by visual inspection the percentage thecal sac effacement (≥50%, <50%) on lumbar spine CT and the percentage thecal sac effacement (≥50%, <50%) on lumbar spine MR imaging. The percentage thecal sac effacement was determined by visually inspecting the area of the thecal sac at the most stenotic level by using the axial and sagittal planes and comparing it with a normal level above or below the stenosis (Fig 1). A threshold of 50% thecal sac effacement was used because this was easily reproducible and, on the basis of preliminary analysis, was a threshold below which the cauda equina and conus medullaris would not be impinged. A 50-year-old man with acute-onset bilateral lower extremity numbness and severe low back pain. Application of the CT-PTSE imaging marker is demonstrated. Spinal stenosis from a disc protrusion at the L5/S1 level is assessed by delineating the estimated area of the thecal sac at this level (dashed black line, A and B). A normal reference level is identified just cranial to the stenosis (solid black line, A and C). The readers determined that CT-PTSE for this stenosis and others throughout the lumbar spine was <50%. 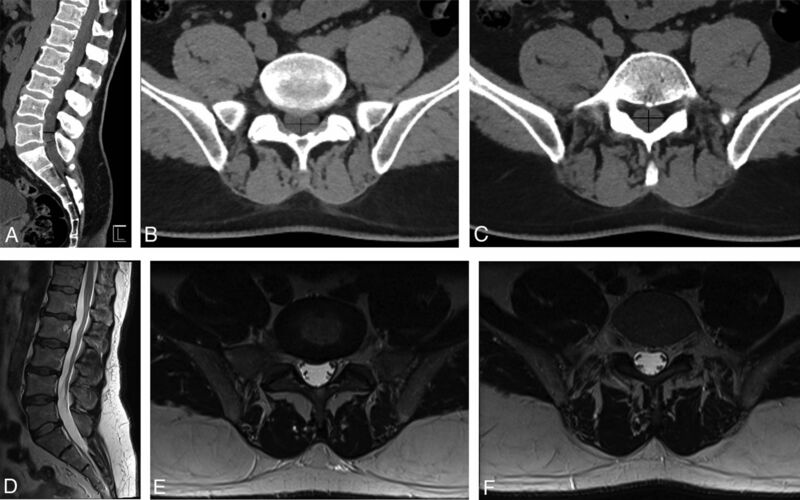 MR imaging of the lumbar spine performed on the same day (D–F), with axial images through the L5–S1 stenosis (E) and the reference level (F), demonstrates concordant results with <50% thecal sac effacement and no evidence of cauda equina impingement. Images were reviewed independently by 2 radiologists: a Certificate of Added Qualification–certified neuroradiologist with 9 years of radiology experience and a radiology resident with 1 year of radiology experience. The presence or absence of cauda equina impingement on MR imaging was also recorded. Cauda equina impingement was defined as complete effacement of CSF within the thecal sac secondary to an extrinsically compressing lesion. 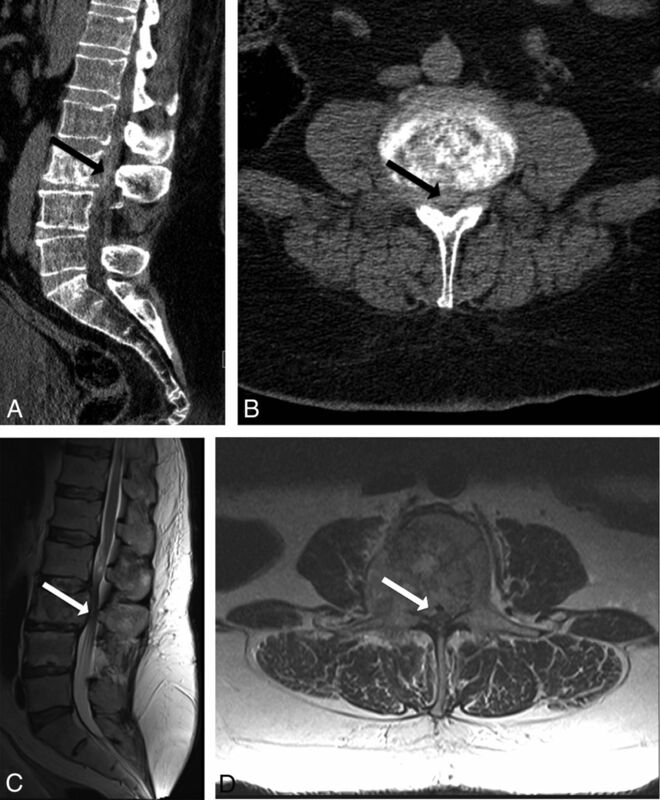 The underlying dominant cause of spinal stenosis on MR imaging was recorded (traumatic osseous retropulsion, degenerative changes, tumor, hematoma, infection). Levels analyzed spanned T12/L1 through L5/S1. Early tapering of the thecal sac secondary to prominent epidural fat was not considered positive for cauda equina impingement unless associated with a superimposed compressive lesion. Interpreting radiologists were blinded to all clinical and imaging report information. MR images were reviewed 2 weeks following review of CT images with readers blinded to the CT interpretation. Any disagreements were resolved by consensus. Using lumbar spine MR imaging as the reference standard, we performed statistical analysis to determine the sensitivity, specificity, positive predictive value, and negative predictive value of lumbar spine CT in detecting percentage thecal sac effacement of ≥50% and cauda equina impingement on MR imaging. MedCalc 11.5.1.0 software (MedCalc Software, Mariakerke, Belgium) was used to perform statistical analysis. Statistical significance was P < .05. Interrater agreement for imaging markers was determined by using the κ statistic. Patient demographics and clinical characteristics of the study population are listed in the Table. Of 151 patients, 40 had MR imaging percentage thecal sac effacement (MR-PTSE) of ≥50% (23 degenerative, 12 traumatic, 3 neoplastic, 1 hematoma, 1 infection). Of 40 patients with MR-PTSE of ≥50%, 19 had cauda equina impingement (10 degenerative, 6 traumatic, 2 neoplastic, 1 hematoma). One hundred eleven patients had MR-PTSE of <50%. No patients with MR-PTSE of <50% had cauda equina impingement. On the basis of the evaluation of lumbar spine CT, the readers determined that there was CT-PTSE of <50% in 97/151 cases and CT-PTSE of ≥50% in 54/151 cases. Reader sensitivity for the detection of significant spinal stenosis (MR-PTSE of ≥50%) was 98% (95% CI, 87%–100%), specificity was 86% (95% CI, 79%–92%), positive predictive value was 72% (95% CI, 58%–84%), and negative predictive value was 99% (95% CI, 94%–100%). No cases read as CT-PTSE of <50% were found to have cauda equina impingement. One false-negative case of CT-PTSE of <50% underestimated the stenosis in a patient with MR-PTSE of ≥50% without cauda equina impingement. All cases of CT-PTSE of ≥50% corresponded to the concordant level of maximum lumbar spinal stenosis on MR imaging. Of 151 cases, 86 CTs were performed with contrast and 65 CTs were performed without contrast. There was no significant difference in sensitivity (P = .37) or specificity (P = .06) for predicting MR-PTSE of ≥50% between the 2 groups. Interreader agreement for determination of CT-PTSE was good (κ = 0.62). 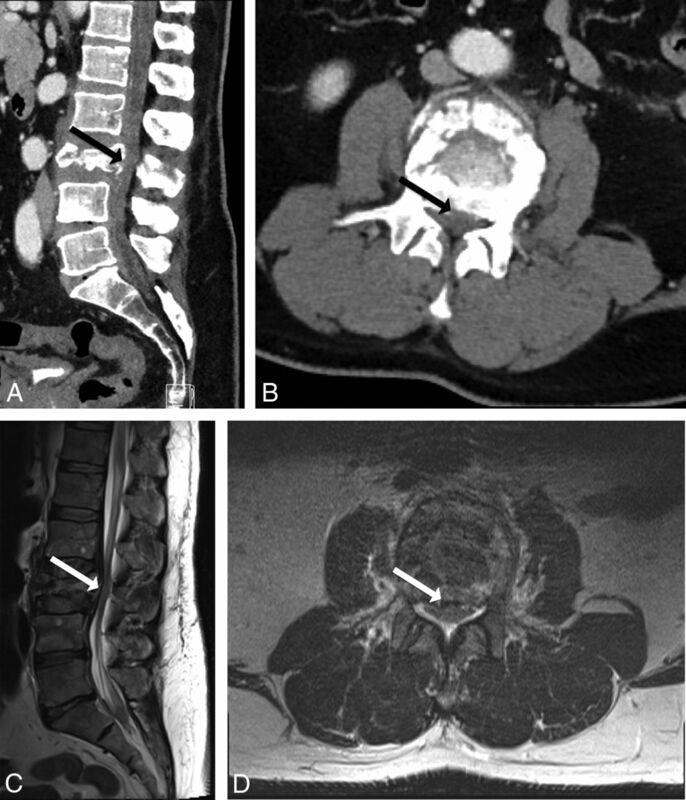 Soft-tissue resolution of lumbar spine CT with the application of the CT-PTSE marker to rule out degenerative CEI (Fig 1), identify patients at risk for degenerative CEI (Fig 2) and neoplastic CEI (Fig 3) is demonstrated. Figure 4 shows how, in the setting of trauma, CT can readily identify a patient at risk for traumatic CEI by delineating osseous effacement of the thecal sac. In certain cases, streak artifacts from hardware or surrounding bone limited the diagnostic accuracy of the CT-PTSE marker (Fig 5). A 61-year-old man with acute bilateral increased lower extremity paresthesias. 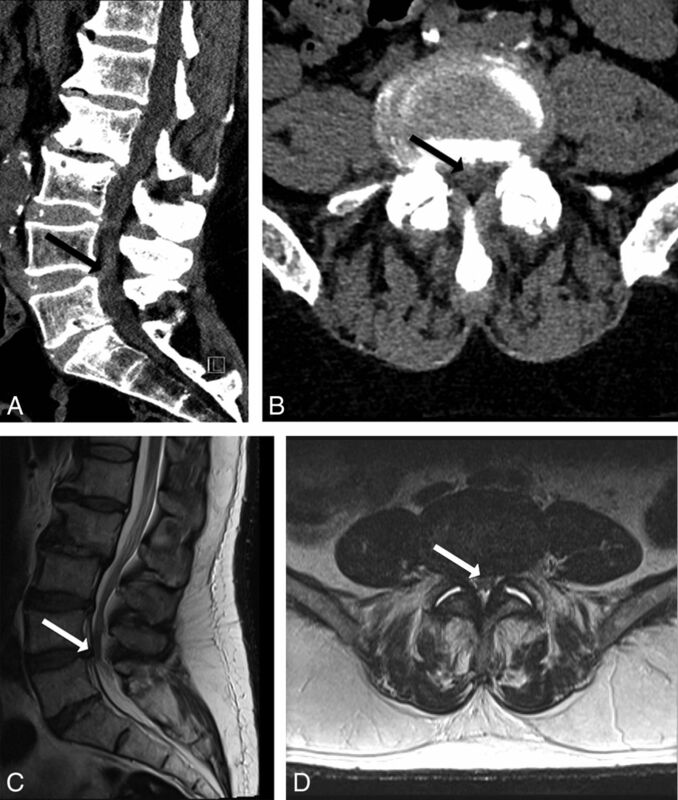 CT (A and B) demonstrates degenerative spinal stenoses, most severe at L3/4 and L4/5 (solid arrow). Readers determined that CT-PTSE was ≥50%. MR imaging (C and D) confirms PTSE of ≥50% and demonstrates early impingement of the cauda equina. A 59-year-old man with metastatic renal cell carcinoma with worsening left lower extremity pain and difficulty ambulating. CT (A and B) demonstrates sclerotic osseous metastasis at L3, with a hyperdense soft-tissue component bowing and extending through the posterior vertebral body wall (solid arrow). Readers determined that CT-PTSE was ≥50%. MR imaging (C and D) confirms PTSE of ≥50 and demonstrates impingement of the cauda equina by tumor. 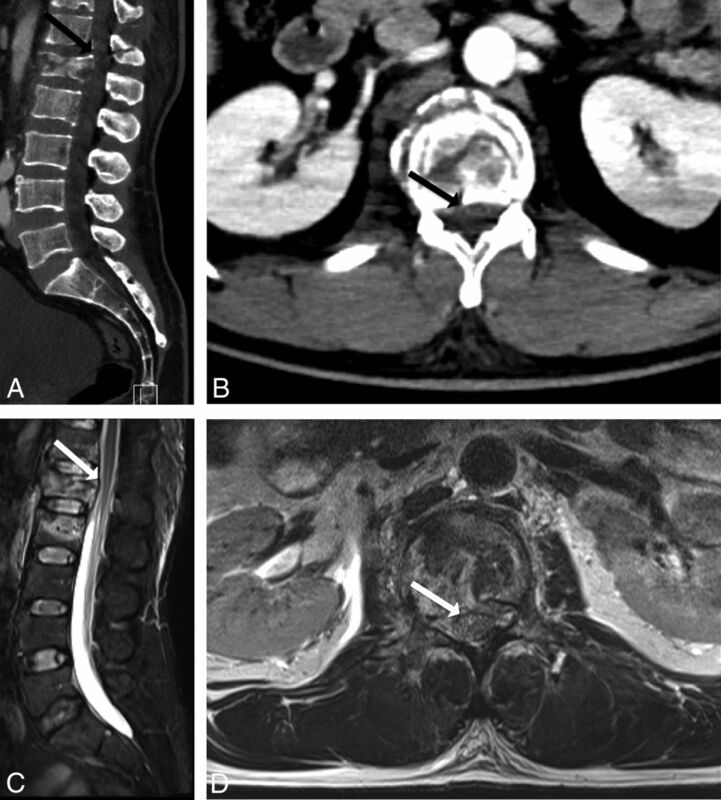 A 55-year-old man with severe low back pain following a fall from a roof. CT (A and B) demonstrates an L3 burst fracture with osseous retropulsion into the spinal canal (solid arrow). Readers determined that CT-PTSE was ≥50%. MR imaging (C and D) confirms PTSE of ≥50% and demonstrates impingement of the cauda equina. A 42-year-old woman with lumbar back pain following trauma. CT (A and B) demonstrates a burst fracture of L1 with retropulsion of bone into the spinal canal (solid arrow). Streak artifacts from bone and the patient's upper extremities obscure the margins of the thecal sac, and readers determined that CT-PTSE may be ≥50%. This case proved to represent a false-positive because MR imaging (C and D) demonstrates a PTSE of <50% and no evidence of cauda equina impingement. The purpose of this study was to determine whether CT could reliably and safely identify patients with significant spinal stenosis and cauda equina impingement. Our results demonstrate that CT-PTSE has a high sensitivity and high negative predictive value for detecting significant spinal stenosis on MR imaging. On the basis of careful analysis of CT alone, the readers missed no cases of cauda equina impingement. The American College of Radiology Appropriateness Criteria for the evaluation of cauda equina syndrome lists MR imaging of the lumbar spine as a level 9 rating (“usually appropriate”), with CT of the lumbar spine listed as a level 5 rating (“may be appropriate”).2 This determination is based on the superior soft-tissue contrast resolution of MR imaging in evaluating lumbar spine pathology, particularly for visualizing nerve roots within the thecal sac, anatomy not readily visible on CT. We found that with careful adjustment of the CT window-level settings, in addition to bone, CT can distinguish the margins of the thecal sac by identifying various levels of soft-tissue attenuation within and around the spinal canal, including intervertebral discs, epidural fat, and CSF within the thecal sac. This limited soft-tissue resolution of CT allows one to reliably determine the PTSE, a marker that we hypothesized could infer the presence or absence of underlying cauda equina impingement when applied with a threshold of 50%. We found CT-PTSE a useful imaging marker in predicting significant spinal stenosis on MR imaging and one that excluded cauda equina impingement in our patient population. While CT cannot replicate the superior soft-tissue contrast resolution of MR imaging in evaluating lumbar spine pathology, careful analysis of CT-PTSE can help radiologists communicate to the clinician their suspicion of significant spinal stenosis and cauda equina impingement. This imaging marker may be particularly useful in the community setting where some centers may have limited access to MR imaging in the emergency department. On the basis of our observations, a clinician could potentially decide to defer MR imaging in cases with a low clinical suspicion and CT-PTSE of <50% or to expedite MR imaging in cases of CT-PTSE of ≥50%. There were several limitations to our study. We used a retrospective design and included both contrast and noncontrast CT examinations of the lumbar spine; however, there was no significant difference in our results when adjusting for the presence of contrast. Most of our cases were degenerative and traumatic in etiology, and we had few cases of tumor, infection, or hemorrhage. The level of reader experience was also relatively low (9 years and 1 year, respectively); however, neither reader missed any case of cauda equina impingement, and increased reader experience might have improved the specificity and positive predictive value of results obtained in this study. Additionally, there are limitations related to the 50% PTSE threshold. While we did not encounter patients with a low-lying conus medullaris, it is possible that those patients could experience distal thoracic cord or conus impingement at a PTSE of <50%. It is also possible that in patients with congenital spinal stenosis, a PTSE of <50% could result in cauda equina impingement. Considering the aforementioned limitations of this study, the CT-PTSE marker to exclude cauda equina impingement may be best-suited for those with a low pretest clinical suspicion. Clinicians may choose to lower their threshold for obtaining MR imaging in cases of suspected infection, hemorrhage, tumor, congenital spinal stenosis, when symptoms or findings are localized to the thoracolumbar junction or in cases in which CT is degraded by artifacts. These results should be validated in a larger prospective study. Areas for additional future investigation may include optimizing CT scanning parameters to reduce artifacts and further improve the accuracy of the CT-PTSE imaging marker. CT-PTSE of ≥50% predicts significant spinal stenosis on MR imaging in patients with clinically suspected cauda equina syndrome. CT-PTSE <50% appears to reliably rule out cauda equina impingement. This imaging marker may serve as an additional tool for the clinician in helping to decide whether MR imaging can be deferred, and it has the potential to lower associated health care costs. American College of Radiology ACR Appropriateness Criteria 2015; www.acr.org/ac. Accessed August 10, 2016. Accepted after revision August 23, 2016.